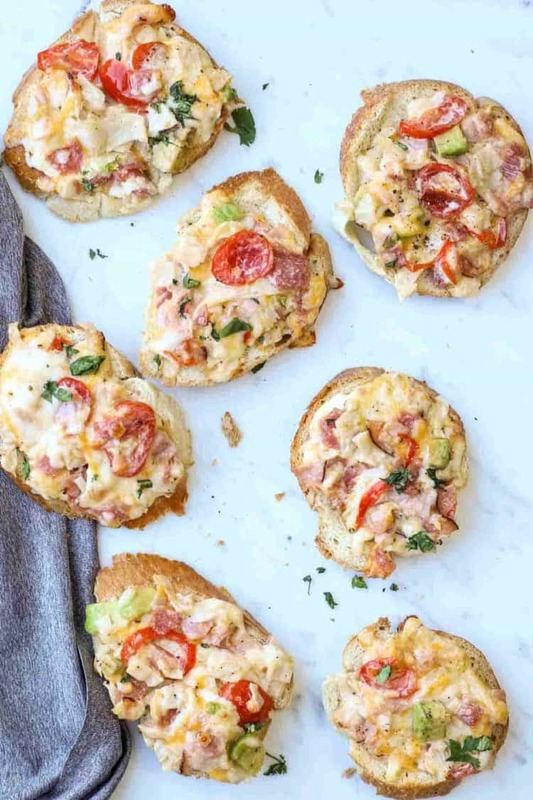 Hot Sandwiches made with a variety of lunch meats with green onion, cheese, and mayo topped with tomatoes, avocado and spread on french bread and toasted to crunchy perfection! 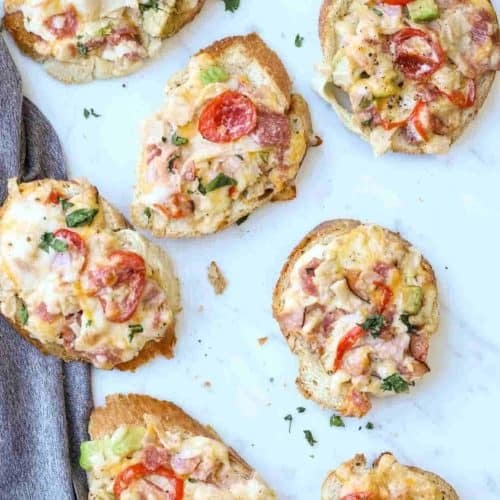 This recipe is great for breakfast, as an appetizer, or your next party! 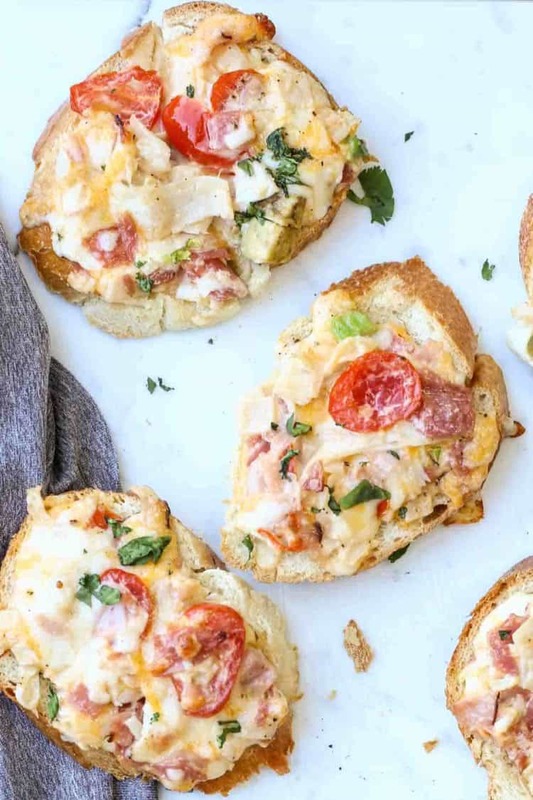 Try these Hot Seafood Appetizers! As a stay at home mom, some days I am not in the mood to go all out for breakfast or lunchtime just for myself and the little ones. Something quick works just fine. That’s why I just love these hot sandwiches. Most days my husband is up early and I love sending him off to work fed and satisfied. I prepare everything the night before, then, once I’m up I just mix everything and toast them. By the time he is dressed and we have prayed, breakfast is served. So quick and easy. Just keep mixture covered in the fridge and it will stay fresh for days:). If you make our recipes, don’t forget to tag us on Social Media @Valentina’s Corner and use #ValentinasCorner. Chicken Mushroom Alfredo Canapes– A great canape recipe with chicken and mushrooms! Chicken Spinach Artichoke– Another simple canape recipe. Spinach and Artichoke Canapes– Canapes with creamy spinach and artichoke spreading. Hot sandwiches with a variety of meats with mayo and green onions, tomatoes, avocado and cheese then toasted. Chop lunch meat. Slice green onions thin. Slice tomatoes. Cube avocado. Add to bread and bake in preheated oven to 365° 10-12 minutes. Enjoy warm. Use this recipe for brunch whenever I have guests! This looks so good. Love the quick video. Thanks so much, Alana. I’m so glad to hear these videos are appreciated. They’re so fun to create:). Hope you love the recipe. ham, salami,green onion, cilantro, cucumber, cheddar cheese, garlic and mayo. I also topped my husbands sandwiches with a Fried eggs and he loved it. I can live on easy meals like these.. Thank you for making the fam bam happy ? Yelena, please tell your sweet 8-year-old he put a HUGE smile on my face today, so sweet! Yes, I’m with you. Some days, recipes like this are the best kind! I love that you added an egg to your hubby’s – yumm!